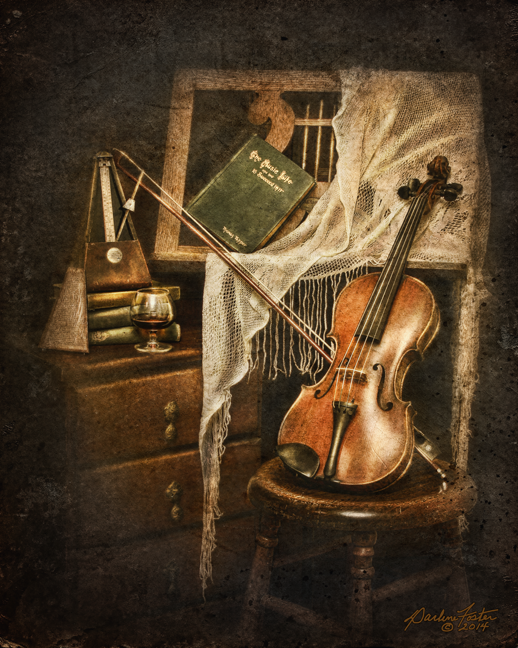 The Music Life ©2014 - This still life was built around the lovely, old violin made in Germany sometime in the late 1800's. When putting together the composition, the first thought that came to mind was the old joke "How do you get to Carnegie Hall? - practice, practice, practice!" so the first thing I added was the vintage music stand from the 1920's. Next came the Maelzel metronome circa 1900 which still works very nicely, by the way. The vintage chest, books, stool and scarf were added for support along with a glass of brandy to help the notes sound better (or worse depending on how much is consumed!). Last but not least the book, "The Music Life and how to Succeed in it" by Thomas Tapper written in 1891 gave me the title. To quote the author: "I am constantly surprised as I study the motive with which many enter the music life expecting to win success in it. To be an artist one must live the life of an artist; the semblance of it will not do. You must put heart in what you do. We all reverence toil but toil alone is not enough; it must have soul. In one form carbon is but a bit of coal, in another intensity it is a diamond". "The Treasure Chest" wins Best in Show! 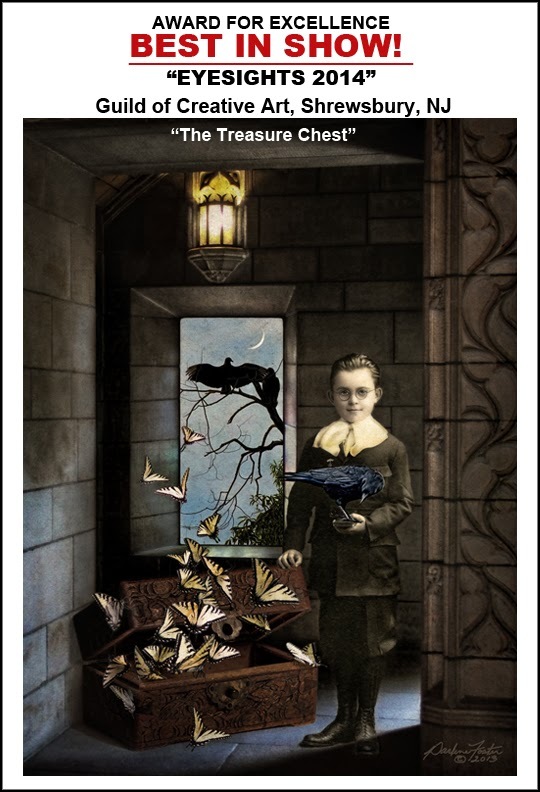 So, so excited to say "The Treasure Chest" was awarded Best in Show for the EyeSights exhibit at The Guild of Creative Art! Thanks so much to the judges Liz and Bob McKay of McKay Imaging Photography in Red Bank, NJ and all the people at The Guild for an outstanding show! Congratulations to all the award winners and artists whose work make this exhibit an incredible example of talent!